To glimpse the next phase of Portland dining, pull the handle of a wall-mounted meat grinder. It’s hidden at the end of a dim hallway, in the back of bustling east-side spot PaaDee. One yank, and a nondescript bookcase moves sideways, revealing Langbaan, an intimate Thai speakeasy holding court three nights a week. 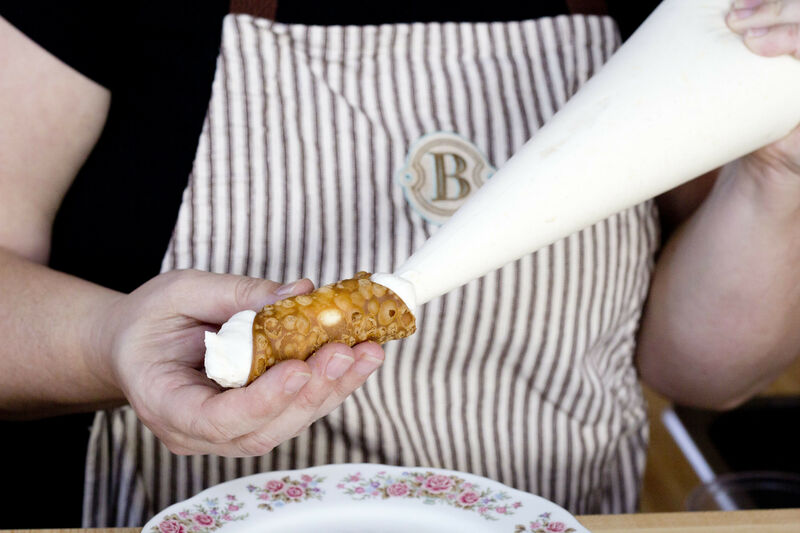 Want to stick a fork in the latest interation of Portland's avant garge dining scene? 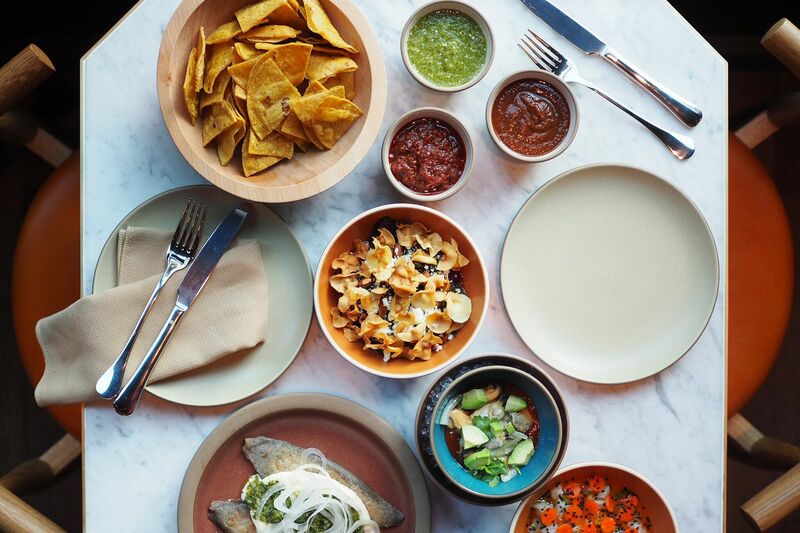 Check out our handy guide to Portland's best UnRestaurants! The cozy, cramped kitchen looks like a foodie’s vision of a Bangkok night market, with herbs everywhere, soup vapors billowing, and moody shadows creeping from table lamps. It only hints at what’s to come: a two-hour tasting menu of traditional snacks, coconut-chunked soups, raw dishes, chile relishes, grilled pig parts, and some shockingly delightful desserts buried in salty coconut cream or infused with Thai candle smoke. No choices. No substitutions. Plunk down $40, settle in, and let the kitchen do the work. At least so far, this is the food of the year. At Langbaan, opened in February, PaaDee owner and Bangkok native Akkapong “Earl” Ninsom reconsiders Thai food for a new generation of Portland diners. For these savvy thrill-seekers, the aggressive, straight-from-Chiang Mai flavors of Andy Ricker’s nationally celebrated Pok Pok are now the norm. At Langbaan, choreographed evenings thrash with herbs, refinement, and a new sense of excitement: “seriously old-school Thai cooking,” as Ninsom calls it, replete with tastes rarely seen stateside. A night in this back room moves from dried baby snakehead fish, crushed with fried shallots over coconut rice, to an epiphanic treat born in Bangkok’s Chinatown: black sesame dumplings in a sweet-hot ginger broth that zings straight to the brain. 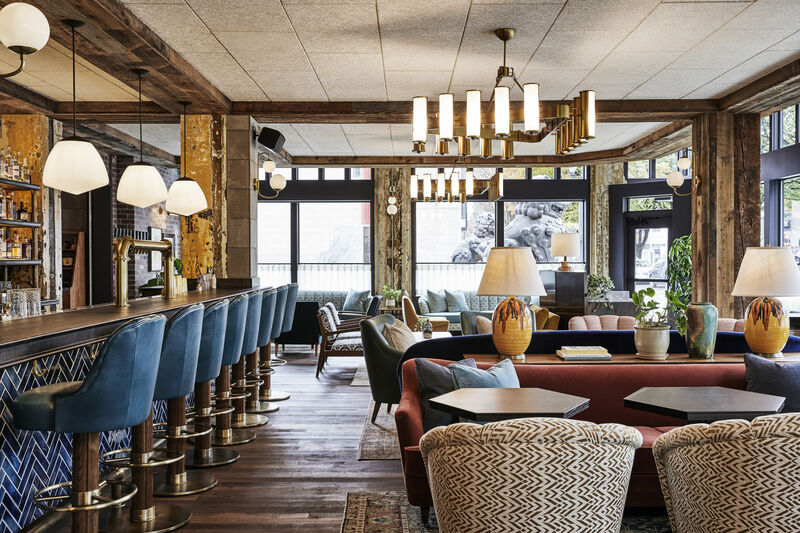 While the food is unlike anything else in town, Langbaan is not alone in its inversion of the traditional tropes and structure of a restaurant. Curious, ambitious, boundary-pushing tasting menus and dinner series are suddenly everywhere, except where you might expect them: traditional upscale restaurants. Young chefs, some armed with techniques gleaned at distant Michelin-starred temples, are reworking Portland’s food culture into surprising, seductive evenings. They’re reclaiming forgotten storerooms and squatting in other chefs’ restaurants and—judging by the number of customers marking birthdays and other special occasions in these spaces—maybe even mapping a new route to fine dining in a city that has willfully rejected it. I call them the unrestaurants: a hybrid of pop-up dinners and brick-and-mortar dining rooms that serve one-of-a-kind meals with an air of professionalism on a limited, but ongoing, basis. Some of them are raising the roof on flavors; others are fascinating but exhausting, like a Lars von Trier movie. The beauty is how they’re cracking open doors to new models of eating. The unofficial center of the unrestaurant movement is KitchenCru, the gleaming commissary kitchen and chef’s counter that rents hourly on the North Park Blocks. That model allows chefs who have great ideas to test them out, one night at a time, without ponying up the capital required to start an actual restaurant. The result is a constant, night-by-night rotation through wildly different concepts, the dining equivalent of a down-and-dirty rock club, hosting the experimental garage bands of local cooking: a culinary CBGB that could hatch a future Noma. Recent months have showcased the vegetable savvy of Coquine, courtesy of Katy Millard, who stood apron-to-apron with lauded chef Daniel Patterson at San Francisco’s Coi. Cru honcho Michael Madigan and kitchen manager Jeff McCarthy moonlight as their own occasional series, TenTop: two dudes doing molecular gastronomy while cross-talking with the diners who watch their descent into cooking madness. A recent TenTop “breakfast for dinner” screeched from a miso-soy-ginger bagel smeared with kimchi cream cheese and a truckload of bulgolgi to waffles and fried-chicken ice cream lashed with foie gras butter. TenTop may not win any Michelin stars, but the takeaway is universal: fried-chicken-skin caramel really does belong on everything. The Cru is also home to Holdfast Dining, where Will Preisch started cooking up a fresh vision of fine dining last July: intensely creative, tweezered on the spot, then handed across the counter to diners. Almost overnight, Holdfast vaulted into the top tier of Portland dining, and Preisch earned Portland Monthly’s tag as Rising Star Chef 2013. Now, three nights a week, the bearded wonder and co-chef Joel Stocks belt out personal food operas at the crossroads of Europe’s new-wave school and low-key Portland. Industry folks worship on off nights, diners shout out recipe requests, and a customer at the next stool felt at home enough to steal a bite of my dehydrated chocolate mousse. At first, Preisch says, he wondered if Portland would embrace his concept. He got his answer: when Holdfast’s online reservation system goes live each month, seats vanish in 10 minutes or less. A restaurant that doesn’t exactly exist in the conventional sense seems to be the hottest reservation in town. 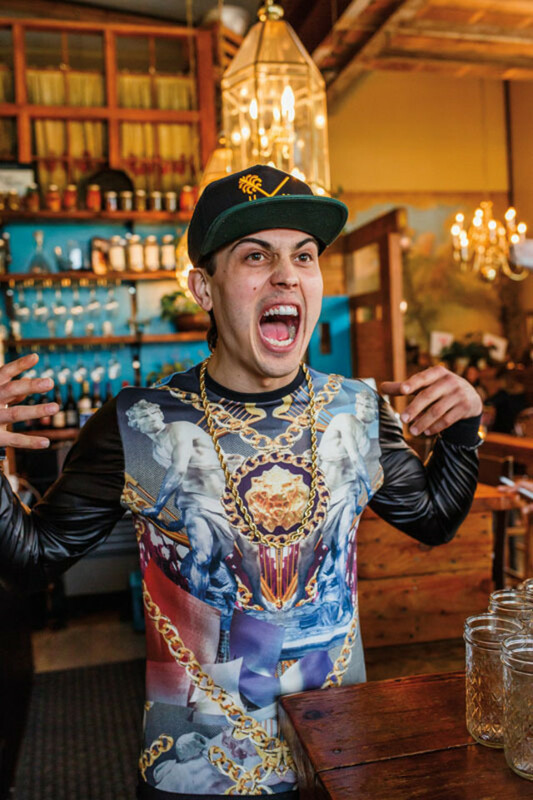 Bartender Brandon Gomez at Ned Ludd’s Weekly hip-hop and pizza–fueled P.R.E.A.M. 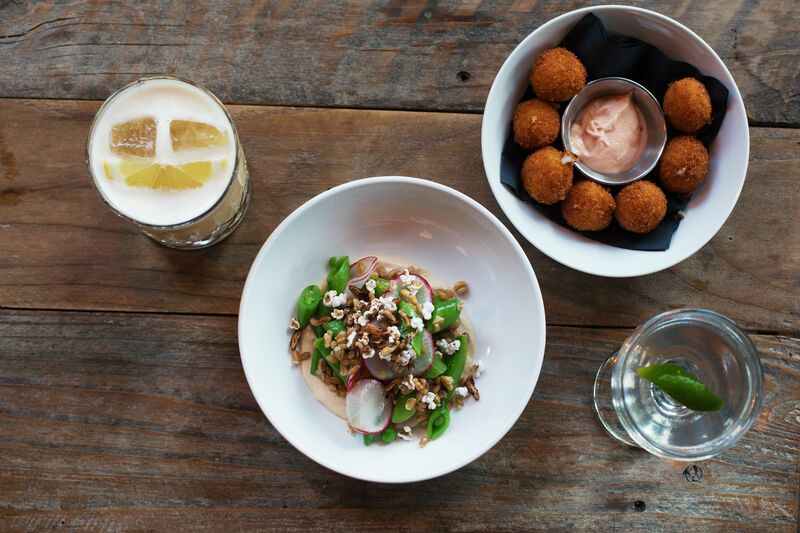 Over in the northeast, a different transformation takes place every Monday night at Ned Ludd. Chef-owner Jason French hands over the restaurant, normally a house of wood-fired rusticity, to line cook Nicholas Ford, and the Ludd morphs into P.R.E.A.M. (“Pizza Rules Everything Around Me”). Ford was seduced by pizza at Brooklyn, New York, hot spot Roberta’s, where he worked the ovens before moving to Portland last year. The 25-year-old told French he was burning to make pies his way, to his music. Now, once a week, brassicas and smoked lardo dance over fire-kissed dough, pizza boxes stamped with “parental advisory” labels dangle from chandeliers, waiters don gold chains and goofy grins, and the sound system pumps a killer set of early dance-party rap. (The playlist arrives alongside the menu.) In one swift beat, French makes money on an off night and Ford finds a missing link in Portland’s food scene: the convergence of Wendell Berry and Wu-Tang Clan. Somebody say hoe. So far, P.R.E.A.M.’s mini-menu is an inspired work-in-progress. Seasonal salads are a wee overdressed, and a fluff of white chocolate cremeux, pistachio crumbs, and sticky-good marmalade is, alas, a bit too cremeux for Grandmaster Flash. But Ford’s pizza is in the groove, as kale and burnt honey meet on blistered crusts tasting like smoky, chewy saltines. One night’s special looked positively forbidding, its charred greens, chewy lardons, and fontina bound in fermented chile funk. But like most things at P.R.E.A.M., it shouts and sings. One can’t help but imagine what would happen if every chef in town handed over the reins to an ambitious sidekick for one night a week. 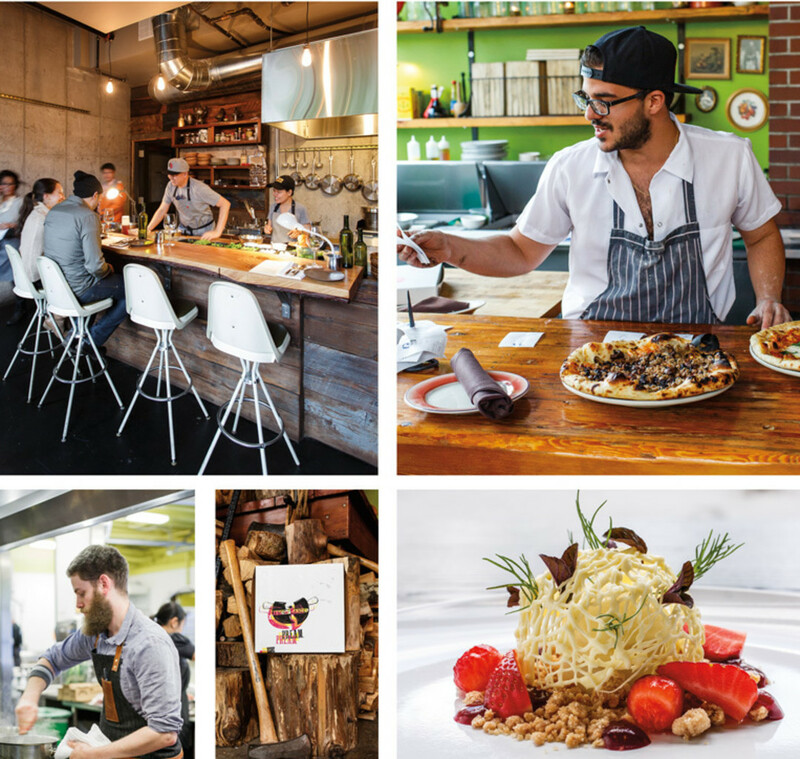 The move could cement Portland’s reputation as the ultimate culinary incubator. Other projects are hatching at a fierce clip. As we go to press, bone marrow candles burn and anatomically correct heart-shaped cupcakes rise at the Table at Yamhill, where former Beast meat man David Crabtree-Logan and wayfaring cook Sariann Lehrer open their Southwest Portland loft to epic feasts. With Nomad.PDX, 27-year-old former Castagna sous-chef Ryan Fox, who sharpened his knife at Las Vegas’s demanding Joël Robuchon at the Mansion, serves 10-course meditations on food in every stage of life, complete with artist collaborations, guest chefs, and, yes, custom-made plates tailored to the meal. It’s not just upstarts, either. You think you know Vitaly Paley, Portland’s white-jacketed, James Beard Award–winning, Iron Chef–crushing lord of Paley’s Place. Get ready. In June, the 50-year-old icon debuted DaNet, a portal to his Russian roots: the smoked salmon and hand-cured caviars, the forgotten zakuski (drinking foods), a way of life crushed by Soviet standardization. He’s going the distance, transforming his downtown Portland Penny Diner once a month with sit-down dinners, curated vodkas, vintage tchotchkes, and music from the Motherland. (Russian rap? Are you serious?) At a test-drive pop-up this spring, Paley was near tears, baring his soul, culinary and otherwise, to strangers. He wasn’t alone. The luxuriously creamy potato pancakes, a recipe learned at his grandmother’s side, put all others to shame. Paley’s revelatory blini could even put a smile on Putin’s face. Even as he juggles headaches from two restaurants, Paley is willing to gamble on this brave new world. “You have to question, to believe there’s something more out there, fun ideas with an emotional attachment,” as he puts it. And if not in Portland, then where? Our food scene has always thrived on low-risk models, from food carts to microrestaurants, fueled by adventurous diners. But this new wave of unrestaurants goes a step further, fully inverting the traditional restaurant model, chiming with a larger trend toward flexible, capital-light new business models in a tech-wired society. At an unrestaurant, diners invest in a vision, rather than restaurateurs investing up front and hoping that diners show up. Five years from now, we’ll look back on these emerging visionaries and see the beginning of a whole new way of dining out.